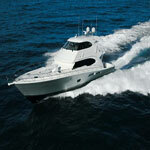 Power Boats, offer a vast range of leisure and watersports opportunities. Waterski, wakeboard, dive or go fishing from them, use them to explore the otherwise inaccessible bays, coves and caves around the Islands of Zanzibar, Pemba or Mafia. The main difference between a Power Boat and a Sail boat is wherever you choose to go, you'll get there much faster in a Power Boat. Power boats come in a range of sizes many include lockers and have comfy chairs and generally they're more spacious than Sail Boats. Power boats are the more comfortable option as passengers sit 'in' the boat, rather than 'on' the boat (this does not apply to Sailing Catamarans). If you've only got a few days available, a power boats could be the right Charter boat for you. Power boats provide space, comfort, luxury and speed. A cruising speed of a power boat allows you to squeeze more into your itinerary. Additional benefits include plenty of modern entertainment facilities such as television, stereo, video and more navigation electronics. The staterooms in your power boat will provide a higher level of comfort normally including air-conditioning, stabilizers, large master staterooms and guest staterooms all with beautifully detailed en suite facilities. Due to their extra speed, power boats can leave sailboats behind, and arrive at destination earlier than sail boats. This means more relaxation time and less time underway. View our choice of Power Boats for more information.